If I take out the link or anchor of the image, ibrowser works fine, any Idea what can be the solution please? Are you using FCKeditor or are your doing some strange mix in order to generate that error? Hello Alfonso, thank you for your reply. The error occurs when I use the image manager button of the ibrowser plugin that appears in the FCKeditor. I installed strictly following FCK plugin instructions. For the rest of ibrowser functions it work fine. 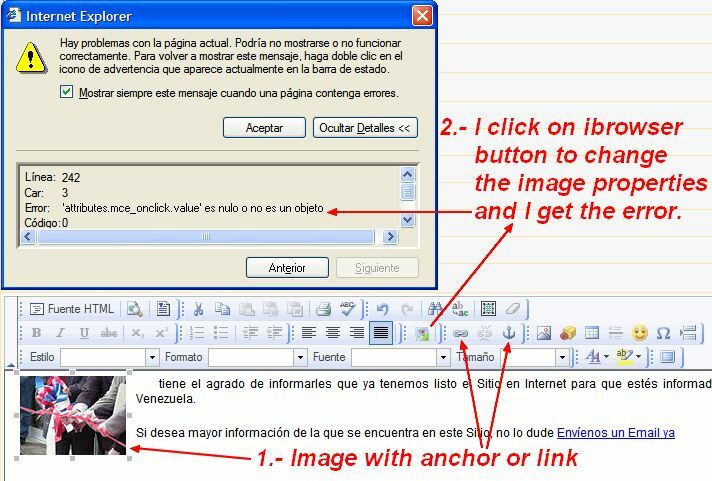 The problem it is only when the image has a link or an anchor I click on the image then on ibrowser and the error appears, please see the attached image for more clarity on my problem.